Place chicken, onion, celery, bay leaves, peppercorns, parsley stems (not the leaves), thyme and carrots in a large, covered stockpot. Add 3 cups of wine and enough water to cover and simmer until chicken is thoroughly cooked, but still tender. Strain and reserve chicken stock. Remove chicken meat from bones and dice it. Melt butter in a large saucepan and add flour; cook for 1 minute. Add half-and-half, sour cream and 3 cups of the reserved chicken stock; blend well. 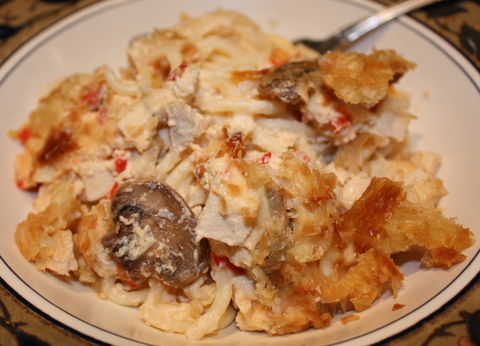 Add pimientos, mushrooms, lemon juice, Worcestershire, cayenne, salt, pepper, 3/4 cup of the Parmesan cheese and the chicken. Another tray that I made for Girl’s birthday party. This is great as a salad dressing or a dip and is vastly better, despite what The Pioneer Woman says, than the stuff in the green and white package. Sorry I don’t have a better photo of the dip, itself, but I was taking these photos as 11 hungry girls were standing by, eager to dig in. 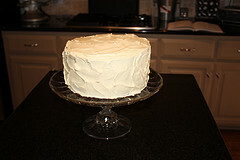 I’ve added the gluten free tag to this post, but, be sure that your ingredients (sour cream, mayo, etc.) 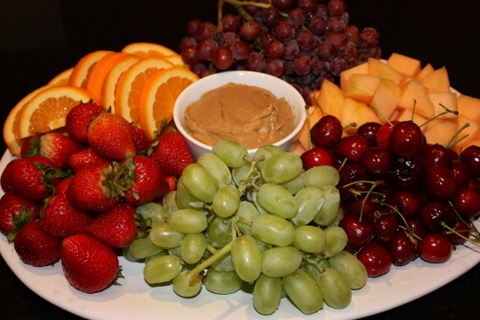 don’t have any starch wheat-based additives or thickeners. If you make this with all-natural (sour cream is supposed to be just dairy, and mayo is supposed to be just eggs and oil, maybe a little lemon juice) ingredients, it will be gluten-free. 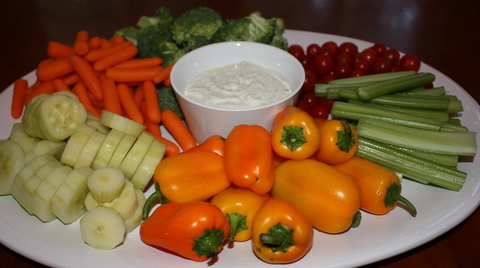 This dip is really tasty and extremely kid-friendly. It’s basically just cream cheese frosting, made with brown sugar, so it’s quite sweet and a little bit goes a long way, but whenever I’ve made this for Boy or Girl’s friends, or to take in to school for a class party, it has been INHALED. Just make sure that folks know what it is, because I made the version pictured above with half dark brown sugar and it turned out so much darker than usual that some of the girls at Girl’s birthday party last night thought that it was peanut butter. 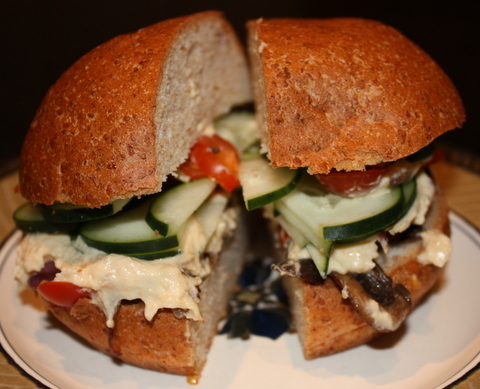 Vegetarian Girl LOVES the “Veggie Delite” sandwich from Thundercloud Subs (a fairly famous Austin chain,) so I thought that I would try to create an “at home” version for her. She liked the sandwich, but said that it was a little bland and that she’d like to add some lettuce, pickle slices and chopped olives next time. So, not bad for a first stab, but we’ll know how to fix it next time. Peanut Butter Noodles recipe here. 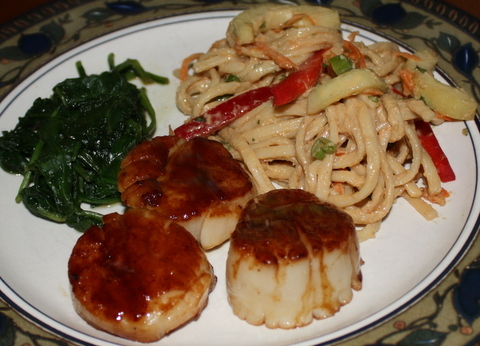 The scallops recipe is from the subscription-only section of Fine Cooking’s website, but basically, you just cook the scallops in a VERY HOT lightly oiled pan (after sprinkling them with a tiny bit of cayenne and salt) until they’re browned on both sides and opaque throughout and then you lightly brush them with hoisin sauce. Easy peasy. 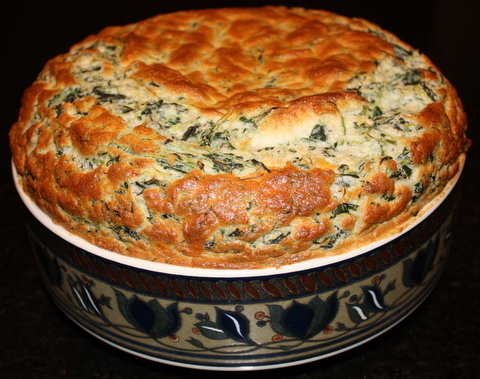 The accompanying spinach recipe is slightly more difficult to sum, but I didn’t use it, anyway. I just sauteed my spinach the same old way, with a little Baby Bam. 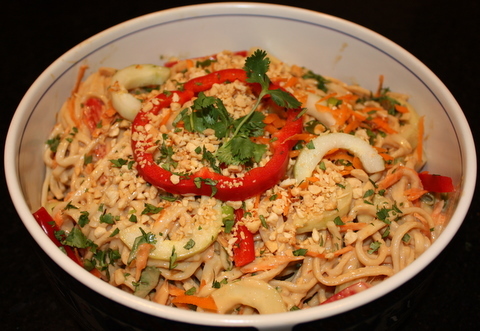 I’ve added the “vegetarian” tag to this post, because the peanut butter noodles would be (and were, for The Girl) an acceptable vegetarian entree, on their own. 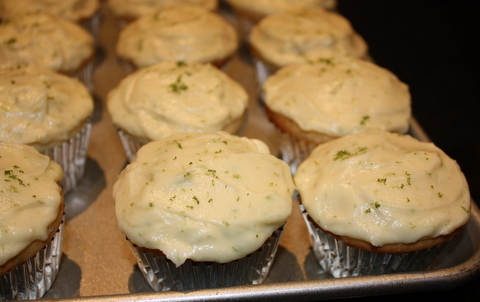 They were delicious and were a huge hit with all four of us. You could add any veggies that suit your taste (mushrooms, water chestnuts, baby corn, broccoli, etc.) and you could add a bit or sriracha to spice it up, if you like that sort of thing. 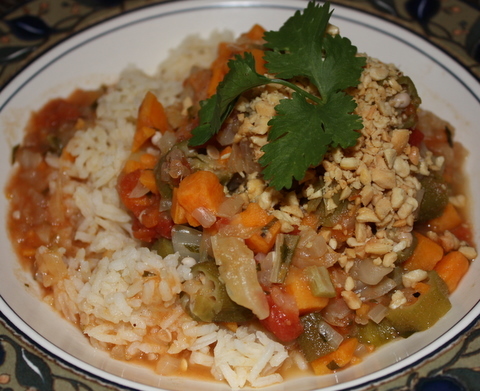 We added cucumber, grated carrot, red bell pepper, cilantro and finely chopped peanuts. I actually made this in January, but somehow forgot to post it until now (just came across the photos when clearing off my laptop’s desktop,) but it was definitely more memorable than my behavior would have you believe. 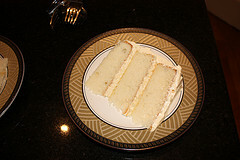 This was a delicious, rich cake that was fluffy and sweet without being cloying and would be a perfect birthday cake for anyone except the most fervent teetotalers. Will be a definitely repeat…possibly for Hubby’s birthday in a couple of months? This was quite tasty. 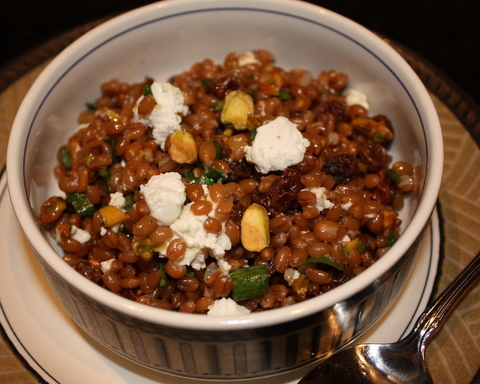 It had a nice lemony tang to it, and the chewiness of the wheat berries was very filling. I’ve always loved souffles and absolutely adore Ina Garten, so when I saw this recipe in House Beautiful magazine, I knew that I had to try it. It was totally easy and really is foolproof. I confess that I even forgot and opened the oven door once and the souffle still didn’t fall. 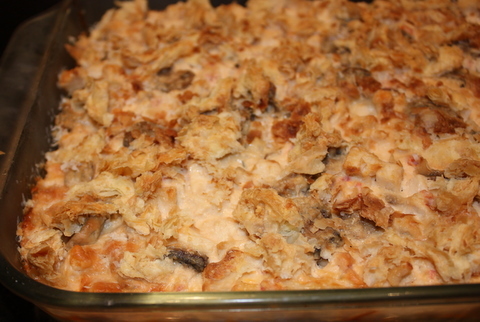 Yummy and cheesy, but also light and fluffy. 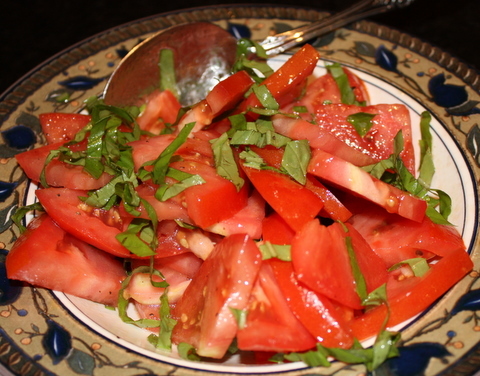 We served it with a fresh tomato-and-basil salad (tomato from our garden…basil from Girl’s sweet Spanish teacher’s garden) and it was beautiful. 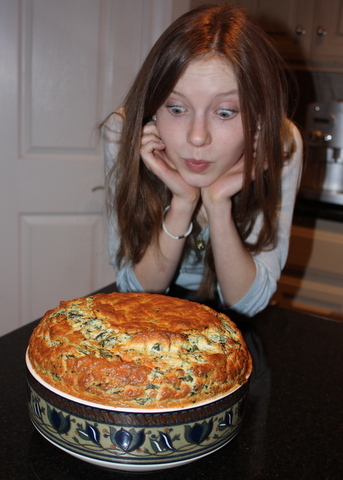 Vegetarian Girl, clowning around with the souffle after it came out of the oven. Beautiful Tomato-Basil salad…no recipe necessary, just sliced tomatoes, thinly sliced basil, a generous pour of olive oil and a sprinkle of kosher salt and freshly ground pepper. This is basically just a cheeseless Caprese salad, but it was delicious.